I was looking for a way to use up all those fiddly bits of scraps, too small to used in projects but too useful to throw out. 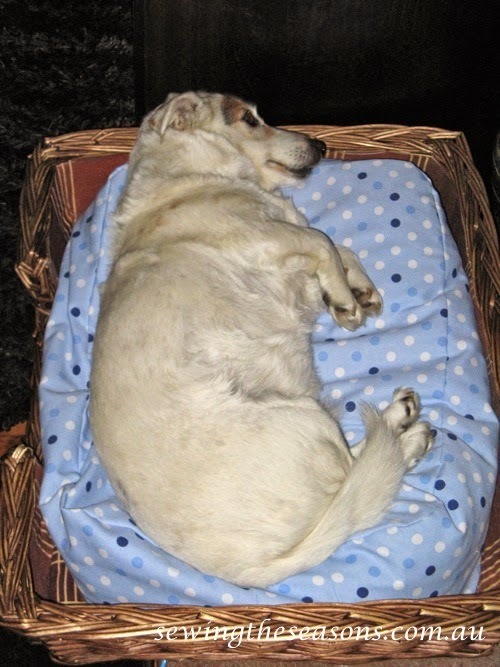 After a discussion with my brother & sister-in-law, I realised the scraps could be re-purposed into a soft & comfy dog bed - a great way to recycle. 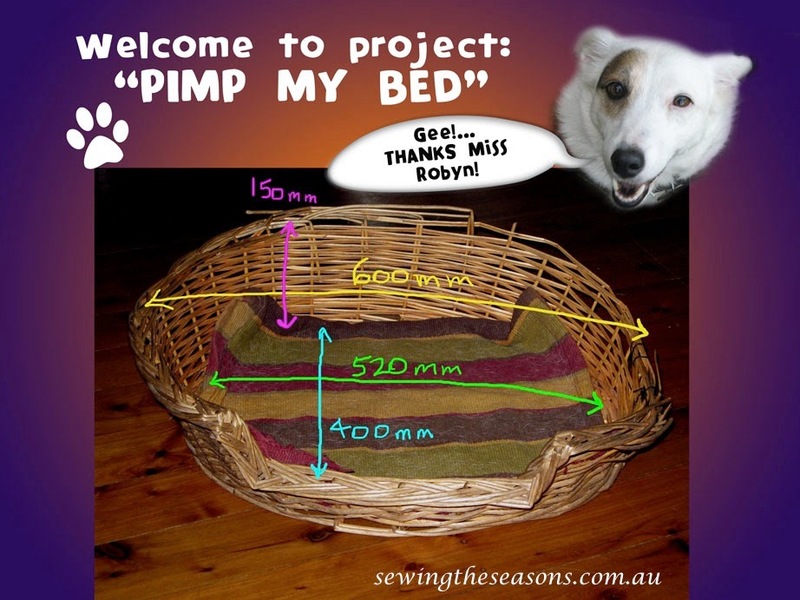 With the measurements of Elly's basket in hand (Elly is a very talented dog as you can see by her picture) & an overflowing basket of scraps I was able to quickly & simply design her a new bed. I marked out the measurements on a piece of butchers paper, using my pin holder to mark the curved corners. I added the outside measurements of each side to work out how long to make the side panel to fit around the bed. Cut out two pieces each of mesh & outer fabric for top & bottom of bed plus a side panel (may need to join side panel to achieve required length) You may be able to see on my notes I have included seam allowance in top & bottom pieces but not in side panel - work to your preference again a really good idea to note what you have done for future projects. Fill the mesh bag with your scraps, then hand stitch the gap closed. Now make the outer cover - for this one I used some strong furnishing fabric but on the earlier prototype I used a piece of ticking. This time, you need to stitch the side panel piece closed as you will be leaving a larger opening either at one end or along one side of the bottom & side panel to fit the filled mesh bag through. Turn out & stuff mesh bag into cover - trick is to leave a larger enough hole to push mesh bag through - my mesh bag wasn't filled to capacity to allow some movement in the finished bed for Miss Elly to settle it into her own desired shape. Turn under edges of gap & machine stitch closed. If desired you can add a zipper for a closing if you want to be able to take inner bag out to air or to wash outer cover but Elly informed me she was OK with the opening just being stitched. 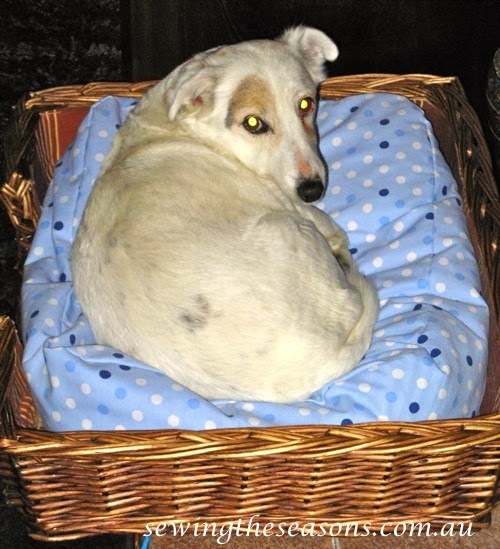 And there you have it, one empty scrap basket, one comfy dog bed. Hint - if you don't do as much sewing as I do, or have as many scraps, this project is also ideal to use up old, soft clothes, T-shirts or sweatshirts ( I would cut up into smaller pieces though & remove any buttons or zippers). Here is Elly enjoying her new bed, always fun watching her check out it is really for her & then wriggling herself into it to make it her own.